___. Education Revisited. In The World Today, edited by Phineas J. Sparer. Memphis: Memphis State University Press, 1975. ___. Language in Thought and Action. 1939. Enlarged ed. San Diego: Harcourt Brace Jovanovich, 1978. Originally published as Language in Action. ___. Symbol, Status, and Personality. New York: Harcourt, Brace & World, 1963. ___. Through the Communication Barrier: On Speaking, Listening, and Understanding. Edited by Arthur Chandler. New York: Harper & Row, 1979. ___, ed. Language, Meaning, and Maturity. New York: Harper & Brothers, 1954. ___, ed. Our Language and Our World. 1959. Reprint. Freeport, NY: Books for Libraries Press, 1971. ___, ed. The Use and Misuse of Language. Greenwich, CT: Fawcett Publications, 1964. 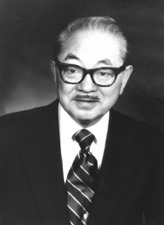 Samuel Ichiye (Sam) Hayakawa in Asian and Pacific Islander Americans in Congress, 1900-2017. Prepared under the direction of the Committee on House Administration by the Office of the Historian and the Office of the Clerk, U.S. House of Representatives. Washington: Government Publishing Office, 2018.